Justice is first mentioned early in Wonder Woman 58, as Wilson and Nord open the issue on Grail and Ares, both imprisoned far beneath Themyscara. If Ares is to be trusted (always a risky venture), his time in prison has truly reformed him, teaching him that it’s not war nor time that truly makes a mark on the world, but justice. He asks for “final justice” and coerces Grail into killing him. This is an interesting move, as his death could indeed be construed as a form of justice, as his paying the ultimate price for his crimes, but it also allows him to escape his prison and be reborn back into the world. Is he truly interested in paying for his crimes, or did he just want to escape? 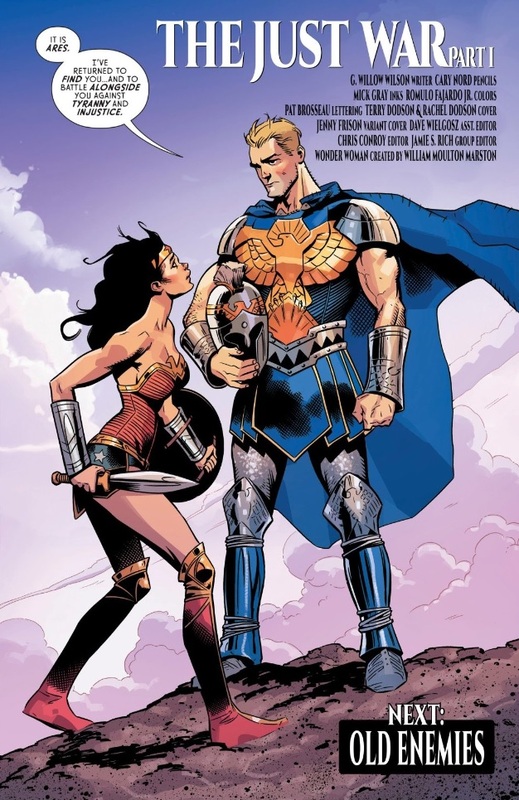 The Ares Diana meets at the end of the issue seems dedicated to his newfound cause of justice, but he still pursues justice via the act of war. Specifically, Ares has joined forces with an independence movement representing the indigenous ethnic minority of a country known as Durovnia; he’s fighting for people who have been oppressed, but his actual methods put him at odds with Diana (though he may not realize it yet). These two panels fall on two different pages in the issue itself. Though there’s no real change in light or environment, colorist Romulo Fajardo Jr. still makes drastic changes to his pallet between the two. The page where Diana arrives is bright and bold, while the background starts to become shrouded in dark purples in the second panel, which seems to show Ares’ pall falling over them all. This stark contrast in color seems to represent the stark contrast between Diana — who will fight for all innocent lives — and Ares — who believes that no life is truly innocent if they side against a supposedly just cause. Diana as a character considers peace, reconciliation, rehabilitation, and justice all as core values, so it should be interesting to see how she tries to stay true to these while dealing with Ares, an opponent she will no doubt be able to see good in, will no doubt want to save, but will also likely be wary to trust, and whose methods she abhors. “Is there such a thing as a just war?” is a juicy enough conflict to begin with, but when both sides have such a personal and moral stake in the answer it becomes even more compelling. Wilson and Nord further complicate their casts’ notions of justice, though, by not making it a binary thing, with Diana on one end and Ares the other. They may be at odds, but Diana’s sense of justice seems far more attuned to Ares’ than to the Etta Candy’s and the U.S. Government’s. 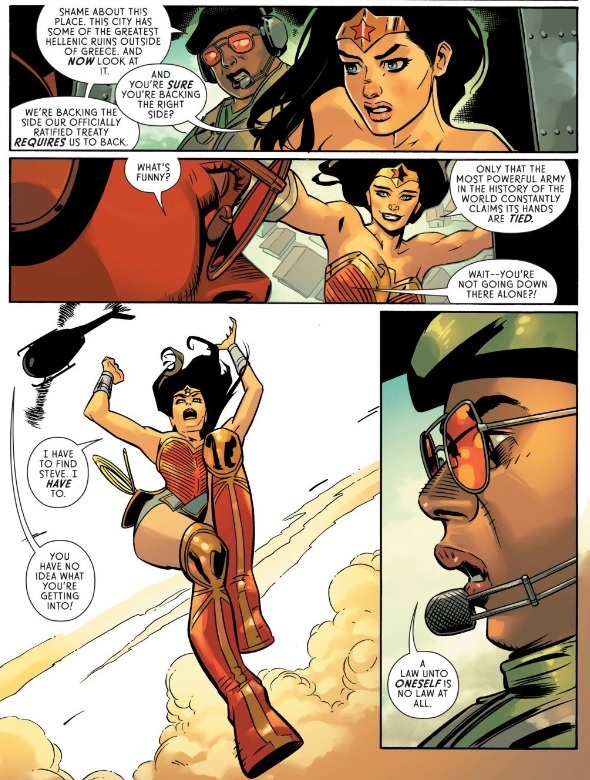 Diana’s a bit of a maverick in this issue, acting only upon her own sense of justice rather than following any one set of laws or instructions, even when they come from a friend like Etta Candy. Diana makes compelling points, arguing that supporting Durovnia just because it’s a “democratic” ally of the U.S. even while they persecute their minorities is unjust, and that doing nothing when you have the power to do something, even if it means breaking the law, is likewise immoral. That doesn’t mean that Etta is entirely in the wrong, though; laws do have their place in maintaining order, if nothing else, and when everybody simply follows their own sense of justice without any regard to anyone else’s, well, then you get Diana and Ares about to throw down in a populated area. 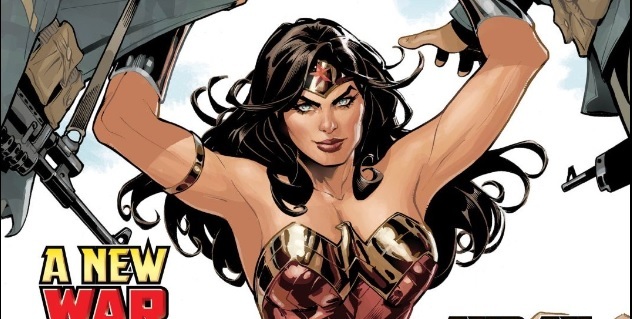 It’s indeed a complicated scenario, and as the first issue of both a new storyline and an entirely new run, Wonder Woman 58 raises these questions without any real answers yet in sight. 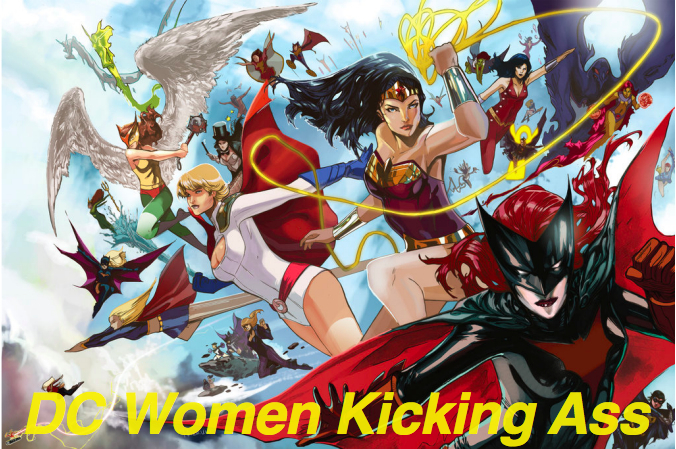 The very fact that Wilson is asking them at all, though, is exciting, especially when they demonstrate such a clear grasp of the Wonder Woman cast and the kind of complicated moral views that motivate them. Drew, I have a good feeling about this run, and I’m eager to see what happens next — how about you? Drew: Oh, absolutely. I hesitate to draw too many parallels to Ms. Marvel, but it’s worth noting that Wilson has extensive experience writing idealistic protagonists whose worldview is challenged by their opponents. That experience has me excited about exactly the same kind of thing you are, Spencer: Diana’s morality is clearly set, strong, and clear, but how that morality interacts with the world leaves a lot of room for her to learn and grow. That is, her heart is unequivocally in the right place, but precisely how those good intentions are implemented offers a rich source of drama for this series. Intriguingly, that implementation is already quite complicated. It’s easy to imagine Diana’s attitudes about war being entirely black and white (as countless other writers have depicted), but that’s not quite what we get here. Diana is as concerned about protecting innocent lives as ever, but that doesn’t manifest as a naive anti-war stance. Indeed, it’s the US Military that holds that naive view. That is, the view that aggression is inherently bad, and thus justifies force against it, is both too simplistic a view and too hypocritical in Diana’s world. 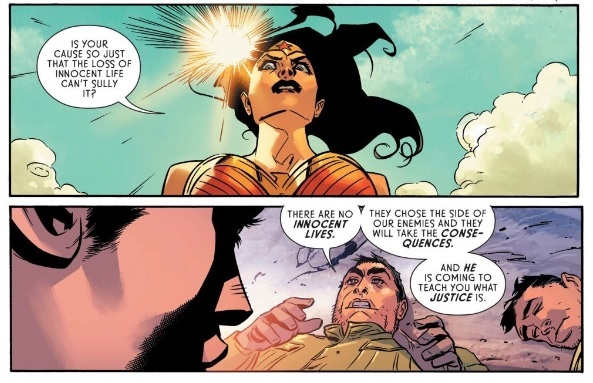 This issue doesn’t suggest that Diana is particularly sympathetic to either side — fighting oppression vs. maintaining “order” — and instead finds her intervening in situations where (seemingly) defenseless people are under attack. Here again, it might be easy to flatten Diana’s morality to “violence is bad,” and that her role here is simply referee for a larger conflict, but Wilson’s approach is much more nuanced than that. I’m particularly enamored of that exchange with Etta that Spencer included above. Diana isn’t offended by the idea of a gigantic standing army or of it being deployed, but she is amused by Etta’s mush-mouthed explanation for how and why it’s deployed in this instance. In Etta’s view, she has an obligation to her country that supersedes her personal morality; in Diana’s view, commanding “the most powerful army in the history of the world” means never having to do anything you don’t find moral. In that way, we understand her interventions here as the moments where she has the power to exert her morality on the world. She can’t stop the entire conflict, but she can stop US soldiers from shooting a child in cold blood, and she can stop a pair of insurgents from shooting an unarmed mother and child. I think that attitude will be particularly interesting to watch as Diana shifts her role from foot soldier on the front lines to diplomat negotiating with the apparent leader of the insurgency. I’ll stop short of using Wonder Woman creator William Moulton Marston’s favored-though-obviously-problematic word “submission,” but this one moment does suggest that her relationship with Steve is unique. Her words take primacy in every other interaction in this issue, but with Steve, she’s much more of an equal partner in conversation. That’s a lot to read into one detail, so I’ll admit that it may just be a coincidence, but I’ll maintain that it’s still an interesting coincidence. The real point is, this creative team has a clear vision for this character that jibes with my Platonic perception of her while still finding room for growth and nuance. It’s a great case study for how to start a run on an ongoing superhero title, ticking all of the boxes with style and confidence. I couldn’t be more excited to see what happens next.